Pledge of Allegiance to the United States flag, is a promise or oath of loyalty to the Republic of United States of America. The Pledge was originally written in August, 1892 by an American Baptist minister and social activist, Francis Bellamy. Pledge of Allegiance was first published in 1892, in the September 8th edition of a Boston-based children magazine called 'Youth's Companion'. On October 12, 1892, it was first used during Columbus Day celebrations. The proclamation made by President Benjamin Harrison and over 12 million children recited the Pledge of Allegiance that day, thereby beginning a school day ritual. Since then, the Pledge is recited daily, by school children of all religious backgrounds across America. The short, 15 second Pledge has an interesting history and since September 1892, the original Pledge has been altered several times, with the last addition being made in 1954 (addition of 'under God'). 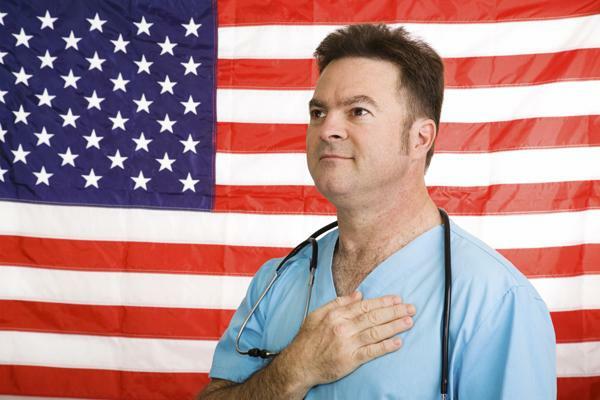 In accordance to the United States Flag Code, the pledge is to be recited by standing at attention; facing the flag and placing the right hand over the heart. People in uniform must face the flag, remain silent and take the military salute. Those not in uniform must remove any non-religious headdress with their right hand and place it on their left shoulder, in such a way that their right hand is over the heart. Today, the words of the Pledge of Allegiance reads: I pledge allegiance to the Flag of the United States of America and to the Republic for which it stands, one Nation under God, indivisible, with liberty and justice for all. ➢ for all - for each person in the country, you and me! By reciting the Pledge of Allegiance, every American promises to be true to the United States of America. The freedom available will not be taken for granted and each American will remember the countless men, women and children who have given their lives through the centuries, so that they can live peacefully today. The Pledge of Allegiance is recited by school children of all religious backgrounds, across America on a daily basis. Daily recitation is done in order to honor the nation one is a part of every morning. However, the recitation is not compulsory, which means no punitive action will be taken against children who do not recite the pledge. It is expected that those who abstain from reciting the pledge should be seated quietly, while the pledge is being said, thereby allowing the others to recite the Pledge. Besides schools, the pledge of allegiance is also recited during the opening of Congressional sessions and also in most local level Government meetings. Unfortunately, most of those reciting the Pledge today are saying it blinding as a ritual, where children and adults alike, recite the words without actually understanding the meaning. Reciting the Pledge is not a compulsion, but a mark of patriotism to the country. It is an action that symbolizes one's loyalty to the United States of America and the feeling that as an American, one is proud to be a part of this blessed country. 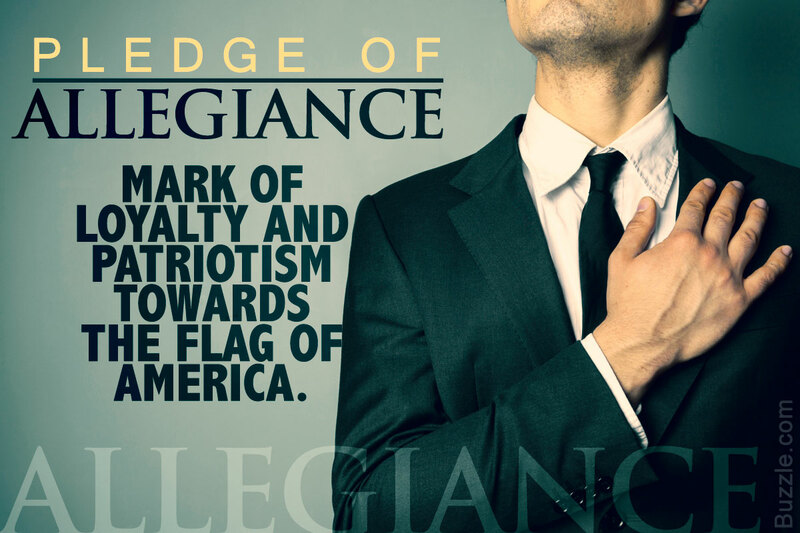 The Pledge is a proclamation stating that all Americans are unified, standing together as one nation and working together for the benefit of the country as a whole. The reason the pledge of allegiance is asked to be recited on a daily basis in schools, is because when a child recites the pledge everyday, he or she may be directed into thinking more deeply about its meaning and significance. 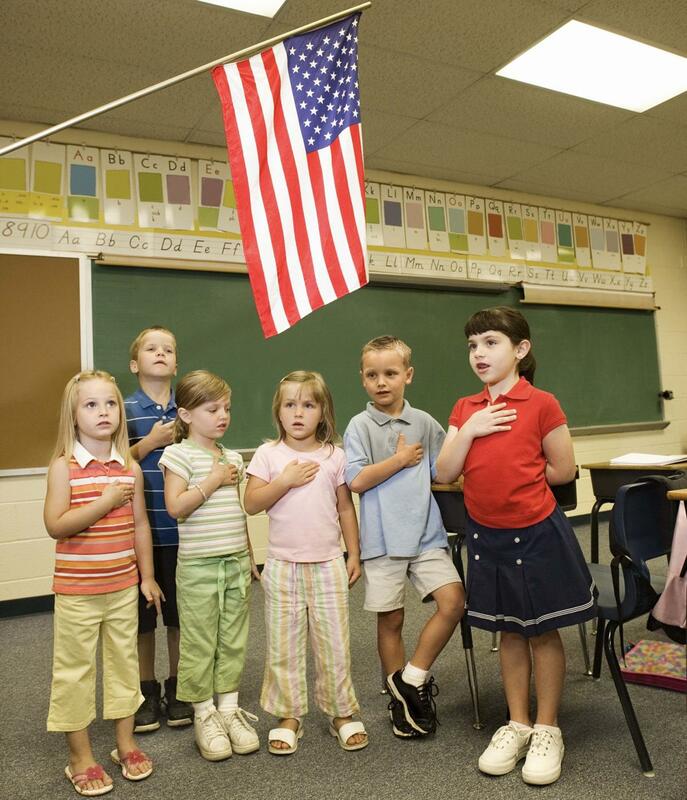 The Pledge of Allegiance is considered to be a platform where kids are given the opportunity to think about their roles as citizens in the country. Reciting the pledge stirs up curiosity regarding their country, thereby inculcating a feeling of patriotism in the long run. Of course, patriotism cannot be forced upon, which is why the recitation is not compulsory. Teachers should explain the meaning of the pledge to the children in simple language, so that they understand what they are actually reciting every morning. It is important to prevent it from becoming another part of the humdrum of life. There is a lot of debate regarding the recitation of Pledge of Allegiance. Many Americans don't say the Pledge and feel that it's unnecessary even to stand up when the national anthem is being played. They defend themselves by saying that by not reciting the Pledge, they are not being anti-patriotic. According to them, standing or not standing; reciting or not reciting does not make them more or less of an American citizen. On the other hand, some people find the words 'under God' objectionable. Atheists and non- Christian Americans state that they cannot recite 'under God', because it happens to be against their beliefs. Then, there are those people who believe that not saying the Pledge is a sign of disrespect to the country. So sadly, we see people with different schools of thought debating and battling over the Pledge and forgetting the larger objective of standing together in unity as a nation. The controversies will go on, however, each American has the freedom to choose to recite the pledge or not. So it is up to each individual!